The Cultural Heritage Committee is responsible for researching, identifying, and protecting historic buildings, archaeological sites and cultural features, including making recommendations on financial incentives such as the Mills Act program. The Committee meets on the fourth Monday of each month, at 5:30 p.m. in the Council Hearing Room, San Luis Obispo City Hall, 990 Palm Street. For more information on these and other CHC projects and programs, contact Brian Leveille, Senior Planner, at (805) 781-7166 or bleveille@slocity.org. The Historic District street sign installation project has been completed. A total of 34 signs have been installed at major entrances to the City's five historic districts (See sign designs and descriptions below). The artwork and graphic design for the signs were developed pro bono by local architect Pierre Rademaker. The City's Cultural Heritage Committee reviewed the designs and installation locations. Look for them throughout town. The Downtown Historic District sign incorporates a commercial style typographic treatment reminiscent of the type style that was typical in 19th century graphics. The architecture is suggestive of the heyday of downtown's construction boom (1895-1910). The foliage illustrates downtown's ever-present street trees. The intent is to encourage people to look up and become more aware of the urban architecture that surrounds us. There are few architectural examples left in the Chinatown District, so the concept is represented symbolically. The dragon is highly esteemed in Chinese culture, symbolizing power and good fortune. Once used to represent the authority of the Emperor, the dragon is distinguished by its claws. The four clawed dragon is considered common, in contrast with the five-clawed imperial dragon. The Old TownDistrict sign attempts to capture the upscale elegance that typified San Luis Obispo's most exclusive neighborhood prior to the turn of the 20th century. The engraved illustration style, typography, colors and border treatment were inspired by period graphic examples. The surrey is drawn from an early SLO source and the architecture is intended to suggest the general feeling of the area without singling out a particular house. The Mill Street District sign depicts the iconic, tree-lined 1300 block of Mill Street at the center of the district. The neighborhood includes a wide variety of early 20th century residential styles including Tudor Revival, Craftsman, Mission Revival, Prairie Colonial Revival, and Shingle. The Railroad Historic District sign borrows its graphic character from an earlier version which has identified the area for many years, which in turn was based on the Southern Pacific Railroad logotype. Actual railroad fonts were incorporated into the design. The prominent 1894 cites the date that the first Southern Pacific train arrived in San Luis Obispo from the north. 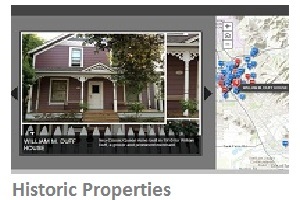 My property is on the Master or Contributing list of historic resources, what does this mean? This means your property has been determined to be a locally significant historic resource because of significant architecture or historical themes. Properties determined to be a historic resource may be eligible for benefits such as the Mills Act. Likewise, building owners of qualified historic properties can follow the more flexible California State Historical Building Code (CHBC). The CHBC’s standards and regulations are intended to facilitate the rehabilitation or change of occupancy so as to preserve their original or restored elements and features, to encourage energy conservation and a cost effective approach to preservation, and to provide for reasonable safety from fire, seismic forces or other hazards for occupants and users of such buildings, structures and properties and to provide reasonable availability and usability by the physically disabled. Additionally, historic properties are eligible to receive a decorative plaque that can be displayed on their property. More importantly changes to historic properties are guided by the City’s Historic Preservation Guidelines and Historic Preservation Ordinance.